The interrogation of global movements that promote LGBT Rights as human Rights has only partially considered the role of capacity building in sexual minority politics. While sexuality has become a focus of both policy makers and academics in some circles of international development, recent literature on global LGBT politics offers a critique of the conceptualization of rights linked to identities that might not be fully realized on the ground, without substantive alternative principles around which to organize. This presentation draws on field research in Uganda and Egypt to argue that human rights as political instruments are contentious, insufficient, and constraining on the organization of sexual minorities. Instead, I argue that key capacities – autonomy, security, and transparency among them – are better vehicles for promoting the human security of sexual minorities and the opening of authoritarian homophobias. Michael Bosia, a Bonham Centre fellow, is the contributing co-editor of Global Homophobia: States, Movements and the Politics of Oppression, for which he is the co-recipient of the Scholar Award of the International Studies Association LGBTQA Caucus. His research on communities facing the pressures of globalization and marginalization has been published in the Journal of Human Rights, Globalizations, Perspectives on Politics, New Political Science, French Politics, Culture & Society, and a number of edited collections. His current project is Global Homophobia and the Politics of LGBT Activism (Cambridge University Press) and draws on ﬁeld research in France, Uganda, and Egypt. I begin with my characterisation of the contemporary politics of Islam versus sexual diversity as a triangulation of homocolonialism, illustrating how LGBT politics is caught up in the promotion of the civilizational superiority of western modernity, and thus opposition to SOGI becomes framed as resistance to western cultural colonialism. The remainder of the talk is focused on how we challenge this political framing and I emphasize the power of an intersectional analytical framework in achieving this end. I begin with the need to highlight LGBT Muslims as an identity that fundamentally disrupts the oppositional locations of LGBT and Muslims and how we can support that disruptive power through building capacity for LGBT Muslim autonomy and visibility. I then move on to discussing how other strategies focused on LGBT groups and Muslim communities are also important in disrupting both the triangulated process of oppositions, and the dichotomous positioning within the triangulation model. Momin Rahman is a Professor of Sociology at Trent University and a Fellow of the Mark S. Bonham Centre for Sexual Diversity Studies at the University of Toronto, both in Canada. His current research is on the conflicts between LGBT identities and Muslim cultures, including a funded research project on LGBT Muslims in Canada. He has published over 20 chapters and articles and 3 books, Homosexualities, Muslim Cultures and Modernity, (2014, Palgrave Macmillan), Gender and Sexuality (2010, with Stevi Jackson, Polity) and Sexuality and Democracy (2000, Edinburgh University Press). In this paper, I argue that stagnation of sexual rights in Nepal is illustrative of some broader failures of the transnational liberal sexual rights movement. 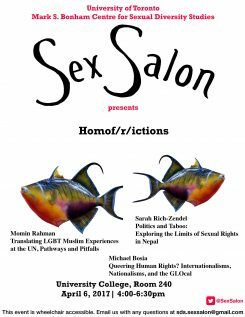 Using Nepal as a case, I will explore explanations for these failures and discuss some alternative approaches to thinking about movements for sexual freedom that consider the relational and cognitive aspects of sexuality. Before beginning her doctoral studies in Political Science at the University of Toronto, Sarah completed a BA in International Indigenous Studies (2007) and an MA in Interdisciplinary Studies (2011) from the University of Calgary. Sarah’s PhD dissertation looks at questions of sexual freedom and the politics of sexuality. What does it mean to live in a sexually free society? What role do transnational and local institutions play in governing sexuality? And what are the limits of liberal sexual rights? She explores these questions in the context of Nepal, where she investigates how sexual taboos influence everyday practices within the education, health and media sectors. For the past twelve years, Sarah has split her time between Nepal and Canada. During this time, she has designed and managed several research projects, including, her SSHRC-funded MA that critically analyzes the gender politics of fair trade networks in three regions of Nepal. She is also the senior research manager of a multi-year experimental study on the efficacy of human trafficking and migration awareness campaigns, a collaboration between Stanford University and Vanderbilt University. Through her research and community work, Sarah has hosted and produced radio programs, scripted a graphic novel and organized public discussions about sexuality.